***** 50% OFF for a limited time as part of the App Store's Get Productive Promotion! 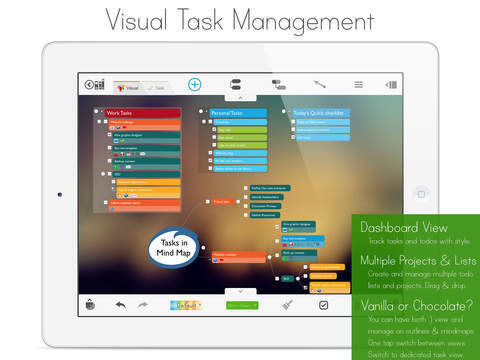 ***** Mind Mapping, Outliner, Visual Notes, Visual Task Manager. All in one page in one App. 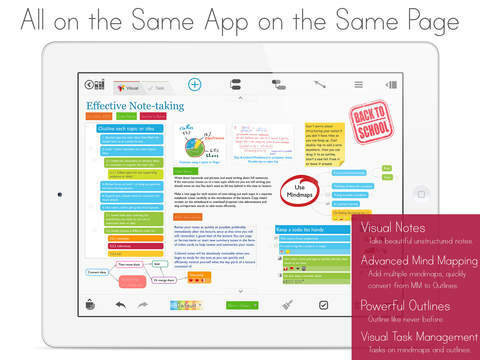 Visually manage your notes, ideas, mind maps, outlines, checklist and tasks for school, personal and business needs. All kinds of information within one page – pictures, web links, documents, attachments, lists, tasks, notes, emails, phones and more. – AWARDS ———————— PC Magazine – "25 Best Small Business Apps" | CNet – "Intuitive no matter your pursuit" | 148apps.com – "Essential iPad app" ***** GET MAGICALPAD FOR MAC TODAY, seamlessly sync your content and work on the big screen with tons of shortcuts and mouse tricks. ***** Five key functions that make MagicalPad unique notes productivity app. FULL-FEATURED NOTE-TAKING & AUTHORING Freeform notes – Place textboxes, outlines mind maps, photos, and drawings anywhere on the page. Brainstorm for an essay, write class or meeting notes, or make lists. Merge and split outlines and easily drag/drop ideas anywhere. Double-tap to create textboxes anywhere then drag them to outlines and mindmaps to structure, connect and prioritize your ideas. Intuitive themes and styles with full style and theme management tools. ADVANCED MIND-MAPPING Advanced mindmapping tools that allow you more freedom in brainstorming and creative note taking. Place unlimited mind-maps and outlines anywhere on the same page and convert freely from mindmap to outline and vice versa, or have a hybrid mindmap of topics and outlines on the same map. Simply drag any information from anywhere to anywhere. POWERFUL OUTLINING Powerful outlining capabilities that allow you to structure your ideas and move them around the page. You can merge and split outlines, lists, mind map branches, attach images, drawings, files and more. You can easily drag/drop to prioritize and vote for your best idea. Full control over level-based themes, item styles and formatting to better visualize y our content the way you want. VISUAL TASK MANAGEMENT Visual task manager is a powerful task management engine that sits within outlines and mind maps enabling you to visually manage your tasks like a dashboard. You can quickly add icons, tags, set due dates, reminders, priority and add attachments to topics, tasks and notes. Drag and drop tasks between buckets, check them off and set dates and reminders. DEDICATED TASK-VIEW Yes, just like your favorite task management app. You can track your tasks in a very focused manner. Focus on a specific date, context, tag, notebook or page. Freely edit and manage tasks and switch between page view to task view at any time. While these functions are powerful on their own, the real magic comes from having them all connected in front of you on the same app on the same page. No need for different apps. * Tons of gestures and shortcuts * Content transfer is via dropbox import and export. – HIGHLIGHTED FEATURES ———————— Go to magicalpad.com/features for full features list. Automatic Content Detection and Internal Links – Link to any item from any page or notebook. – Detects URLs and web links, opens them directly in the browser. – Detects emails and automatically opens them in the mail app. Copyright © 2015 MagicalPad, LLC. All rights reserved.